You may have heard of this new initiative “Live Below the Line” launched for the first time in Canada last Monday, April 29th, by the Global Poverty Project and followed by hundreds of citizens across Canada to support four non governmental organizations: CUSO International, Results/Resultats Canada, Raising the Village and Spread the Net. 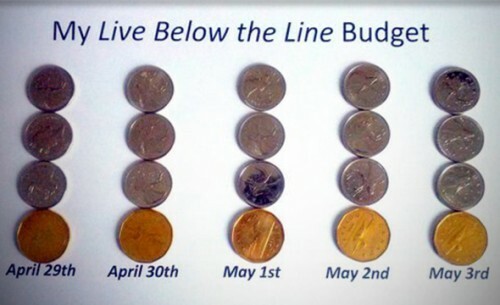 “Live Below the Line” is an innovative awareness and fundraising campaign that is challenging individuals and communities to see how well people can live on just $1.75 a day. 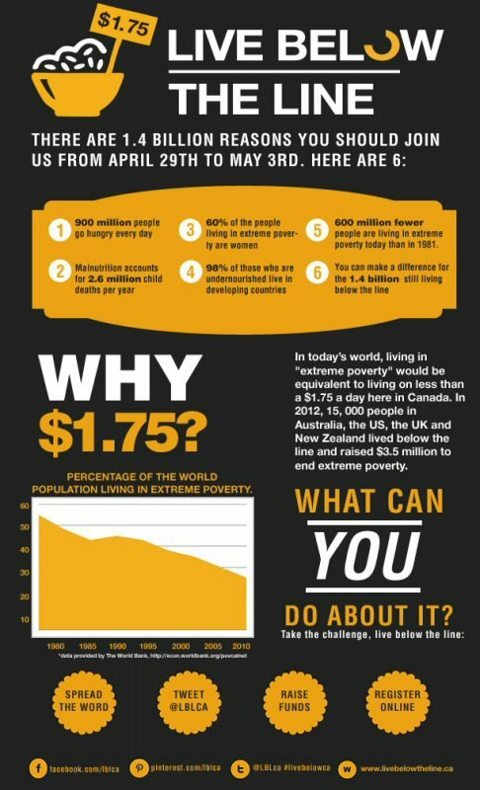 The principle of this campaign is quite simple but really powerful: by living off just $1.75 per day for food and drink for five days, anyone can bring to life the direct experiences of the 1.4 billion people currently living in extreme poverty and can help to make real change. I took the challenge for 5 days last week and raised money for Results/Resultats Canada. My mission accomplished, I went back eagerly to my real life. Moreover, I was still thinking about this valuable experience, how it has changed not only my perception of extreme poverty, but also my engagement as a nutrition security specialist, and more importantly, my implication as a citizen who wants to use her political will to enact change on global poverty issues. For me, the quintessence of “Live Below the Line” is still in motion! Living in Canada for many years now, I am used to a certain standard, and I expect to be able to attain healthy lifestyle without any major constraints. With $1.75 per day, mission impossible! To give you an example, the city of Toronto defines each year the real cost of healthy eating, i.e., $49.87 per week for individuals my age range, which corresponds to $7.12 per day. In this context, $1.75 per day, which represents 24.6% of the cost of a nutritious food basket, is definitively below the line. Forget as well the Canada Food Guide – 3 fruits and 4-5 vegetables, 5-6 grains, 2 dairy and/or alternatives, and 2 meat and/or alternatives – during these five days, this won’t be possible at all. When you are health & food conscious, “Live Below the Line” demands a good understanding of nutrition science, a lot of planning and a strong mental spirit. And I really tried my best. Two weeks before the challenge, I tested different recipes, localized best bargains for food, found ways to maintain my protein intake at an optimal level, and made some drastic choices between having fruits or vegetables – not both, too expensive. My menu for this 5-day challenge was quite simple: oat pancakes with banana for breakfast, congee (Chinese soup with rice and lotus seeds) for lunch, rice with split peas and grapes for dinner, two snacks (a boiled egg and an apple) to stave off hunger and the same tea bag for the whole day as well as a lot of water. No fancy French cuisine! My first day was difficult, a few hunger pains, a mild migraine and caffeine withdrawal. But the fact that I had 5 small meals per day, a good breakfast to start, and a good intake of protein, helped me to adjust quite well with my new diet. An analysis of my food showed me that my daily calorie intake was slightly too low to maintain my body weight (-23%); these calories were mostly carbohydrate (+26%, when compared to my daily requirement) and protein (-12%). In contrast, my fat intake dropped significantly (-64%). Impossible for me to meet my daily requirement for essential omega-3 fatty acids, I didn’t plan to eat fatty fish, enriched eggs, flaxseeds, chia or raw hemp seeds or walnuts, too expensive. The “Live below the line” diet had also a significant impact on my micronutrient intake, mostly because I was not able to diversify my food during these five days. As I was able to maintain my iron and vitamin C adequately, my calcium (43% of my daily requirement), vitamin A (40%) and vitamin D (0%) were significantly low or nonexistent. Hypothetically, continuing the same foods and nutritional pattern may ultimately affect my overall health. I might develop cardiovascular disease – the leading cause of death for women in Canada, and suffer later in live from osteoporosis. This is a non negligible risk factor for me, mainly because I really think that access to diversified and nutritious foods is a pivotal aspect of a healthy and active lifestyle. “Live below the line” requires a lot of discipline and self-control but this is not enough to ensure good health when nutritious food access is limited. There is no place for creativity around food. It is more like a routine. You fill your stomach, you just want to fill it and move on. What I missed the most, was the possibility to diversify my food intake, to maximize my healthy food choices without financial constraint and more importantly, to cook, give and share food with my friends and relatives. Food defines our place in the society! Food is pleasure! When doing this specific challenge, I was able to experience the dehumanization of the feeding process. Feeding ourselves, our family and friends is a social act. Generally, food is the most important thing a mother can give to a child. Universally, mother’s milk is definitely the best food for infants. Food is not just a symbol of love, it is also security, an opportunity for each child to grow adequately and develop his (her) full potential. Food is life! As I am thinking one more time about my experience, I recall the definition of the Right to Food as a Human Right. Each word resonates more deeply than before the challenge, and the whole statement becomes now a reality for me because I have modestly experienced the day-to-day life of people living in poverty. I was part of the “Live Below the Line” campaign. Nutrition and food security are key in the context of human development, economic growth and poverty reduction; and a global effort has been growing around nutrition over the past decade. As a result, the G8 has now put global undernutrition high on its agenda. Moreover, 34 developing countries, “highly-impacted” by undernutrition, have committed to scaling up their nutrition programs. On June 8th, the UK Government will co-host an event with the Children’s Investment Fund Foundation (CIFF): “Nutrition for Growth: Beating Hunger through Business and Science”. It is going to be a day of international action, bringing together governments, business, science, and civil society to improve the quality and quantity of food available to the world’s poorest people. On the eve of the G8 Summit in London (June 17-18), world leaders will have an opportunity to support the developing countries that have developed cost effective plans for scaling up their nutrition programs through the SUN Framework. It is important that we continue to bring international attention to the issue of undernutrition, invest in and scale up nutrition programs that not only reduce child mortality but also consolidate the future of children by reducing the incidence of stunting and its detrimental long-term impacts. At the June “Nutrition for Growth” event in London, Canada will have the opportunity, because of its leadership in nutrition, to inspire other members to invest in developing country-led efforts to reduce undernutrition. It is extremely important that we work together to commit additional finances and political capital to invest in nutrition and food security, to make sure that less and less women and children live below the line in a near future. We’re in full Zambia-mode and making good progress on different levels! On our recent planning trip to Livingstone, we met with the Prime Minister of Mukuni Village and he endorsed the project, which we’re very happy about. We also met with the Town Clerk, the African Wildlife Foundation, the Zambian Wildlife Authority, National Heritage, and so many more. We’re swamped with enquiries from people around the world who’d like to join us as volunteers, which is very exciting! 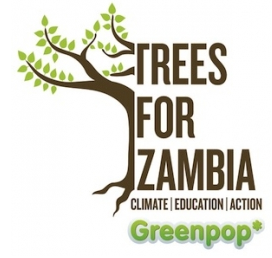 Join us – email zambia@greenpop.org. From a fundraising point of view there have been some exciting developments too; we are talking to several companies about corporate sponsorship (video proposal here), we are selling tree rings, and we’ve just launched a campaign onIndieGoGo, a crowdfunding website. Have a look, help us spread the message, and gift a tree – or two or three! How do you raise funds for 5000 trees in less than 6 months? You get creative! We’ve started all sorts of tree raising campaigns, and one of the most exciting is our Ambassador Program. Because not everyone can come with us to volunteer, the opportunities to support the project needed to be varied, hence the Trees For Zambia Ambassador Program. It’s a competition which will see the person who sells the most trees come with us to Zambia for free, alongside 8 other fantastic prizes sponsored by awesome companies. Huge thanks to everyone who has sponsored prizes… and if anyone feels like adding to the list, please email charlotte@greenpop.org! Our first 25 ambassadors from all over the world have already surprised us with their creativity and motivation, not to mention their success: in just 4 weeks they have already sold 224 trees which is ZAR26,880 altogether! The Greenpop monitoring team visited Ithemba preschool in Capricorn Park on last weeks monitoring trip. 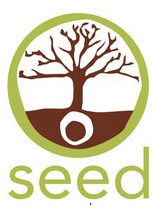 We planted at Ithemba on 1 September 2010 – one of our first planting days ever! Jeremy from Greenpop who was out monitoring last week said: “It was absolutely the highlight of my day! Every tree that we have planted at this beneficiary is alive and well. I spent time chatting with Colin (their groundsman who at the end of last year received environmental training through our partnership with Kirstenbosch Education) about watering, pruning and just how on earth their trees are growing so well!”. Our monitoring team doesn’t always have days like this – planting trees in the Cape Flats is not an easy business. We have good relationships with all of our beneficiaries and are continuously working on improving conditions and on best practice methods. This however, is not fool proof and our team has to work hard with the ground staff to continuously educate and come up with solutions. At the moment our tree survival rate is above 80% and we’re working hard to keep it high. We at CKi would like to congratulate Greenpop on all their success and look forward to hearing more about what they are doing to benefit Africa. Keep up the great work!